We strive to make our facilities a safe environment for detector development work. Users of the facilities are key to making these facilities safe by ensuring that they receive the required training that is listed below. The facilities coordinator can help decide which training is necessary and ensure all users have properly completed training plans (ITNAs). Training classes can be scheduled by on the training schedule web site (requires Fermilab ID number) or by contacting Angela Aparicio. We STRONGLY advise arranging for this training well in advance of the scheduled use of the facilities. It will also help to read all of the reference materials associated with each class ahead of time. GERT: If you do not need to access any beamline under controlled access conditions, then General Employee Radiation Trainingis adequate. This training is required for anyone entering the facilities. Electrical Safety Orientation: This training is to expose unqualified employees to the hazards and consequences of an electrical incident and steps to take to protect themselves from the hazard. This training is required for anyone entering the facilities. 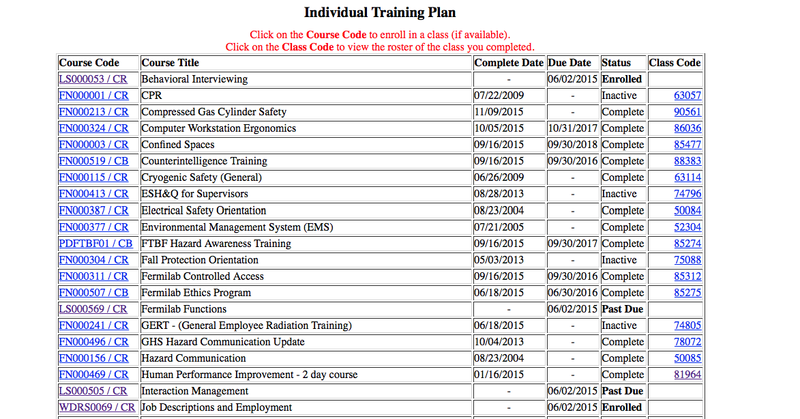 There are site specific training needs which are linked from each facility page. Navigate to a page which is titled Individual Training Plans. Experimenters should enter their Fermilab ID number in the field indicated. For each class indicated as either “Past Due” or “New Requirement” click on the link in the Course Code column. If the text ‘An Online Version of the Test is Available for this Course’ appears, follow the button below it to go to online test.